The Way to Happiness is a common-sense guide to better living. 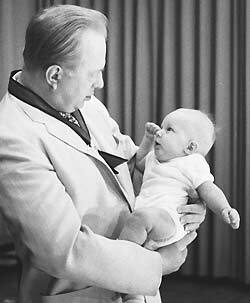 A testimony to the regard in which he held men and women of goodwill, no matter their faith, L. Ron Hubbard wrote this moral code for use by adults and children of all races, colors and creeds. It contains 21 precepts for successful living in a modern world. The following, Precept 4, is included here; others will be published in future editions of Freedom. Today's children will become tomorrow's civilization. Bringing a child into the world today is a little bit like dropping one into a tiger's cage. Children can't handle their environment and they have no real resources. They need love and help to make it. It is a delicate problem to discuss. There are almost as many theories on how to raise a child or not raise him as there are parents. Yet if one does it incorrectly much grief can result and one may even complicate his or her own later years. Some try to raise children the way they were themselves raised, others attempt the exact opposite, many hold to an idea that children should just be let grow on their own. None of these guarantee success. The last method is based on a materialistic idea that the development of the child parallels the evolutionary history of the race; that in some magical way, unexplained, the "nerves" of the child will "ripen" as he or she grows older and the result will be a moral, well-behaving adult. Although the theory is disproven with ease — simply by noticing the large criminal population whose nerves somehow did not ripen — it is a lazy way to raise children and achieves some popularity. It doesn't take care of your civilization's future or your older years. It does no good just to try to "buy" the child with an overwhelm of toys and possessions or to smother and protect the child: the result can be pretty awful. One has to make up his mind what he is trying to get the child to become. This is modified by several things: a) what the child basically can become due to inherent makeup and potential; b) what the child, himself, really wants to become; c) what one wants the child to become; d) the resources available. But remember that whatever these all add up to, the child will not survive well unless he or she eventually becomes self-reliant and very moral. Otherwise the end product is likely to be a liability to everyone including the child. Whatever is one's affection for the child, remember that the child cannot survive well in the long run if he or she does not have his or her feet put on the way to survival. It will be no accident if the child goes wrong: the contemporary society is tailor-made for a child's failure. It will help enormously if you obtain a child's understanding of and agreement to follow the precepts contained in this book. What does have a workability is simply to try to be the child's friend. It is certainly true that a child needs friends. Try to find out what a child's problem really is and without crushing their own solutions, try to help solve them. Observe them — and this applies even to babies. Listen to what children tell you about their lives. Let them help — if you don't, they become overwhelmed with a sense of obligation which they then must repress. It will help the child enormously if you obtain understanding of and agreement to this way to happiness and get him or her to follow it. It could have an enormous effect on the child's survival — and yours. The way to happiness has on its route the loving and the helping of children from babyhood to the brink of adult life. 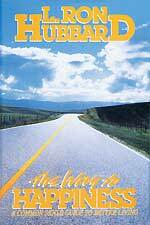 Perhaps the first non-religious moral code based purely on common sense, The Way to Happiness by L. Ron Hubbard is a booklet containing 21 precepts, or principles, for improving morals in today's world. The grassroots demand for this booklet is worldwide, and the precepts are applied by tens of millions around the planet, by men, women and children from every conceivable station in life — from Moscow police officers to convicts serving life sentences in San Quentin, from schoolchildren in Zimbabwe and Beverly Hills to heads of state. It applies to any person's life, anywhere. In The Way to Happiness is a detailed description of each precept, including how it works and how to apply it in life. Rather than just a set of rules or "do's and don'ts," The Way to Happiness provides actual insight and shows how each precept can be put to practical use. More than 64 million booklets are in circulation worldwide. The Way to Happiness is a tool that can help anybody who wants to lead a better, happier life. For a copy of The Way to Happiness, write to The Way to Happiness Foundation, 201 East Broadway, Glendale, CA 91205, call (818) 254-0600, or e-mail info@twth.org.